In all the busyness around Christmastime, I got a little behind my 'current events in historical news' reading. 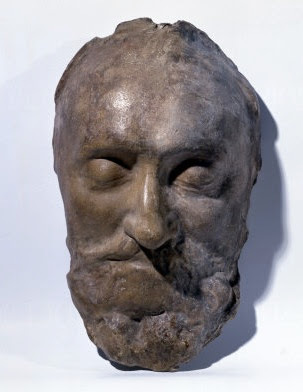 I'm now catching up, so forgive me if you already saw this one, but this last December, scientists announced they'd found the skull of King Henry IV of France in the attic of a retired tax collector. You may be wondering how a private collector came to posses the head of a former king and why it wasn't attached to the rest of his body in the first place. For those who don't know about Henry IV, he was a fascinating individual. 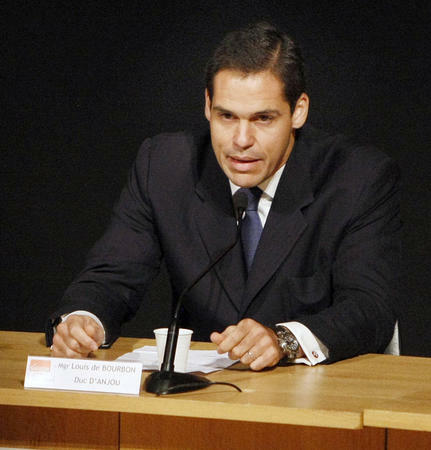 He was born in 1553, heir to the Kingdom of Navarre and a claimant to the French throne. Although he was baptized as an infant in the Roman Catholic Church, he was raised as a Huguenot (French Protestant) and fought with Protestant forces in the Wars of Religion. In an effort to promote peace between French Catholics and Huguenots, a marriage was arranged between Margaret of Valois (the Catholic daughter of the King of France) and Henry (now Protestant King of Navarre). 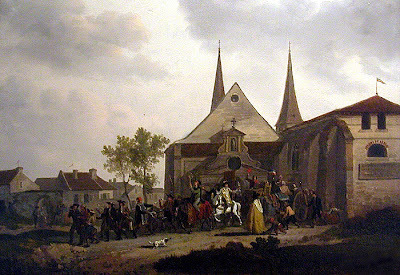 The wedding took place in Paris on August 19, 1572. However, sensing the opportunity to destroy Protestantism in France, Catholics, at the instigation of the Queen, Catherine de'Medici, massacred several thousand Protestant leaders on St. Bartholomew's Day who were in Paris to celebrate the wedding. Henry was going to be killed as well, but the intercession of his new wife spared his life on the condition that he convert to Catholicism. 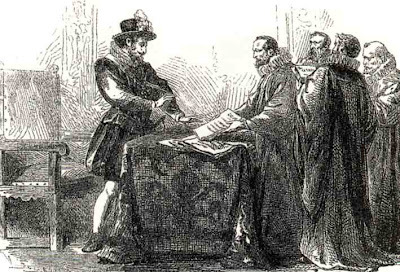 Henry was forced to remain in court, but escaped in 1576. 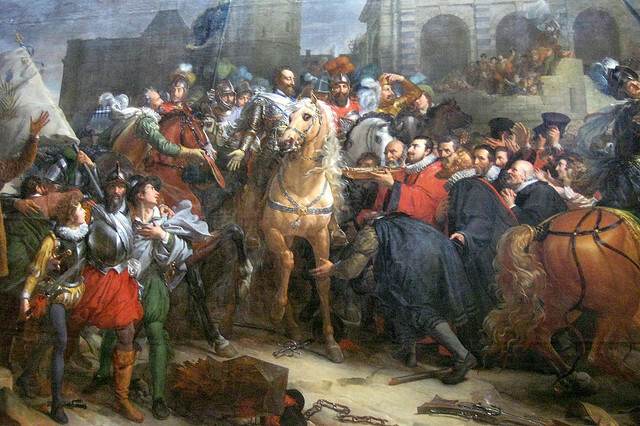 Rejoining the Huguenot forces at Tours, he renounced Catholicism and reconverted to Protestantism. Although a member of the Protestant minority in France, Henry ironically became the legal heir to the French throne in 1584 after the last male of the Cadet branch of the Capetian dynasty died. Henry III (the brother of Margaret of Valois) was still the Catholic King of France, but was opposed by the Catholic League, a militant force of Catholics founded by Duke Henry of Guise, who thought that King Henry III was too accommodating of French Protestants. This led to what became known as the War of the Three Henries (Henry III, Henry of Guise, and Henry of Navarre) in 1587. King Henry III allied himself with the Huguenots (and Henry of Navarre) against Henry of Guise and the Catholic League who were receiving support from Spain and the Pope. 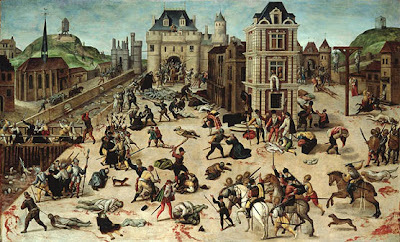 In December 1588, Henry III had Henry of Guise murdered, but the Catholic League retained control the city of Paris and Henry III had to flee to the protection of Henry of Navarre. As Henry III supported by Henry of Navarre was about retake Paris in August of 1589, a Roman Catholic monk mortally wounded Henry III. 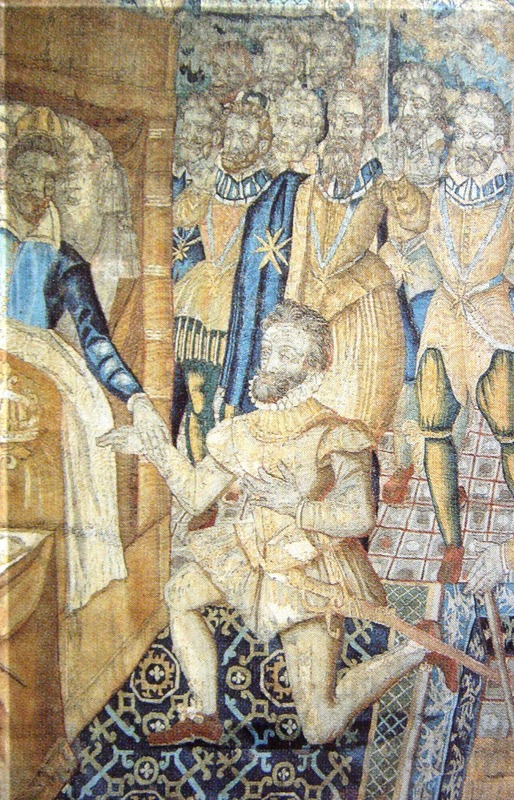 On his deathbed, Henry III urged his supporters to give allegiance to Henry of Navarre (who then became Henry IV). Henry was unable to take Paris after a siege in 1590, largely due to the strength of Catholic opposition to a Protestant King Henry. The Catholic League found itself in control of Paris, but in need of a Catholic claimant to the throne. Not finding a French claimant, the League indicated their support for the Catholic Princess Isabella of Spain. 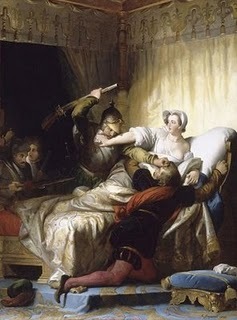 This move weakened the League's support of the French people. In 1593, Henry IV sensing the necessity of Catholic support to take Paris, reconverted to Roman Catholicism for a second time. The following year, his army was able to finally take Paris where he was crowned King of France. 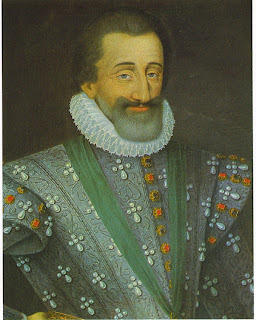 Regarding his conversion, Henry is reputedly stated, "Paris is well worth a Mass." 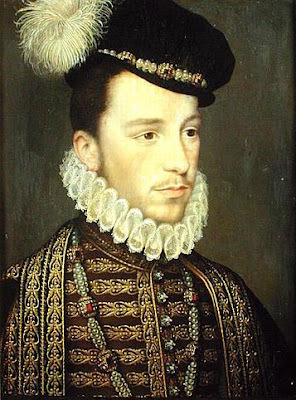 His reconversion alienated Henry from the Huguenots and also from his previous ally Queen Elizabeth of England, but made him very popular with the Catholic majority in France. Henry went on to become a wildly popular and charismatic king. He was known as intelligent and humorous, and being handsome and well liked by women. His people considered him caring and compassionate and he undertook projects to improve the condition of the poor in France. He improved trade with other nations and was successful militarily. Perhaps he is best remembered for ending religious strife with his 1598 Edict of Nantes, which provided increased religious tolerance for Huguenots. For his achievements, he was popularly known as Henry the Great or Good King Henry. Although he was generally well liked, Catholic fanatics made repeated attempts on his life in 1593 and 1594. 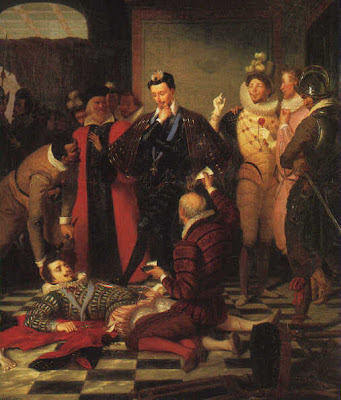 The second attack, left Henry with a gash across his upper lip. 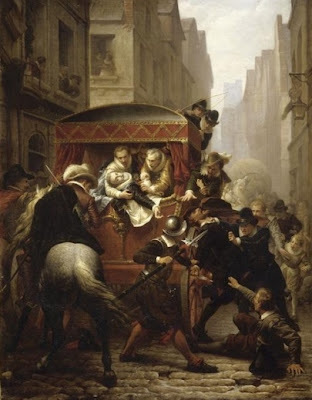 Henry was eventually assassinated in Paris in 1610 as his carriage was stopped in the congested streets. 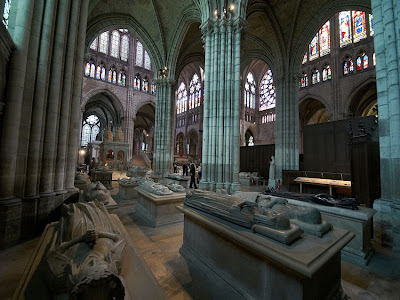 Since the 900s, all but three kings had been buried at the Basilica of St. Denis (just north of Paris) and Henry was no exception; his body was embalmed and interred with the rest. Henry was the first of the Bourbon line. For those familiar with French history, you'll know that the Bourbons ruled from Henry IV through the French Revolution when Louis XVI was executed in 1793. The Revolution quickly spun out of control with the National Convention issuing all manner of odd decrees including changing calendars and clocks. One such decree in 1793 ordered the destruction of all royal tombs, so on October 12, 1793, a mob broke through the crypt of St. Denis. Bodies of former monarchs were pulled from their resting places, stained glass windows were shattered, and sculptures were smashed. The corpses were pulled apart and tossed about in jest, arms were merrily tossed around and skulls were kicked about for fun. When the ugly scene was complete the royal remains were taken outside and tossed into two common ditches. Quicklime was then poured over the corpses to hasten decomposition. 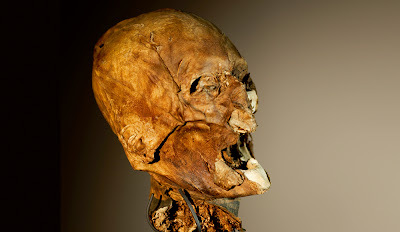 With the exception of Marshal Turenne, whose body was taken to be placed on display at the Museum of Comparative Anatomy, it was believed that most of the remains at St. Denis were lost. When the Burbons briefly returned to power, the ditch was ordered excavated, however no individual identification of the various monarchs could be made, so what was left was placed in a collective ossuary in the crypt at St. Denis. Ironically, Louis XVI and Marie Antoinette had been buried in common graves after their executions and as such escaped the desecration at St. Denis. In 1815, their remains were also brought to St. Denis. It was believed that no royal remains originally at St. Denis survived the Revolution. However, rumors would surface from time to time about artifacts saved from destruction. In 1919, a photographer, Joseph-Emile Bourdais, purchased the head at Drouot's during an auction for three francs. He kept the head in a glass case at his photography gallery and charged visitors to look at it. 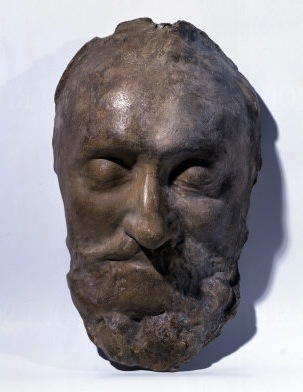 Bourdais was convinced the head belonged to Henry, but could not convince museums of his day. Even the Louvre declined his attempt at gifting the head. When Joseph-Emile died, his widow sold the head in in 1955 for 5,000 francs to Jacques Bellanger, a tax collector. 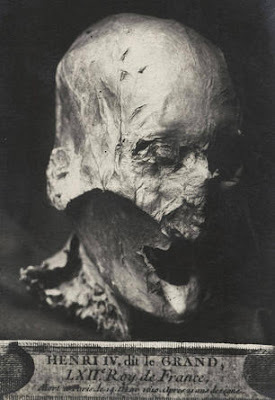 Bellanger kept the head in his attic where it remained until a journalist, curious about a story found in some old news accounts, found Bellanger and asked if he still had the head and if so if he would allow it to be tested for authenticity. A 19-man team of international scientists revealed in December that after extensive analysis, the skull was indeed that of Henry IV. Bellanger has since given the skull to Prince Louis Alphonse, the Duke of Anjou, who in turn has returned the head to St. Denis. Anything interesting in your attic? Very interesting & clearly stated, Nate. Thanks. Your 'live feed' doesn't seem to recognize me today, unless I am just the 'USA' one. We're in southern CO.
Echo Judi. Your historical accounts are fascinating. Love history -- but obviously I don't know much about it! Thanks once again. Very interesting how the "heat of the moment" rampages that so easily destroy things that later seem important keep cropping up in history. "People are the Quaziest Chickens!" Did I just read the game of thrones? Fascinating story. Thank you! This is very cool. I had no idea that the royals were exhumed and scattered around like this. Yes, is very interesting, now what are the other 8 things about Kings?